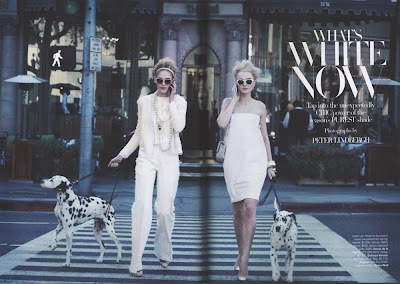 US Harpers Bazaar hits the mark with showing many of the top 2010 spring/summer trends: boy shorts (hot pants), lace, dandy, sheer (see-through) clothing, bib necklaces, and heavily-embellished clothing. white's the new black. jokes but omgsh this is so nice it reminds me of the white party from gg !